Many would regard the Asia-Pacific as one of the fasting growing regions for Information and Communication Technologies (ICT). With Bangladeshi telecenters, Chinese manufacturing hubs, and the popularity of social media in Indonesia, it seems like Asian tech progress is a foregone conclusion. Especially since 717 million young people aged 15 to 24, 60% of the world’s youth, live in there, according to the United Nations. Yet, when more than 30 thought leaders asked, “How Are Youth Using the Internet in the Asia-Pacific Region?“, they found the complexities of mobile entrepreneurship, Internet literacy, physical and cultural barriers, and the role that government sovereignty plays in providing Internet services as opportunities and challenges. A year and a half after President Joko Widodo was sworn into office, Indonesia has contended with a 20% unemployment rate among its 125 million youth. With a concern about how unemployment can affect at-risk young adults, DAI conducted face-to-face interviews to better understand how youth share information. The surveys were conducted in Jakarta and Sumuran; with 170 individuals interviewed, primarily low-income youth, between the ages of 15 to 24. About half of the Indonesian youth surveyed are employed and half are students. A few are studying accounting and marketing. Blackberry Messenger (BBM) holds significant popularity, with some youth users sending as many as 110 messages a day, vs. 30 SMS messages a day. This should pose a concern for development professionals reliant on SMS. We need to be where the youth are (BBM), and not where we want the youth to be. There are a few “ah-ha” moments from this study: besides the popularity of BBM, young entrepreneurs also use social media to sell products, like toys and educational games. However, financing support was seen as missing in this entrepreneurship; survey respondents believe that accessing financing is just as important as the training. But what is the source of Indonesian entrepreneurship? Is it because there aren’t employee opportunities with the private and public sectors, or is it because Indonesians sincerely want to be entrepreneurs? There was debate on whether entrepreneurship should be seen as the key to development among youth. 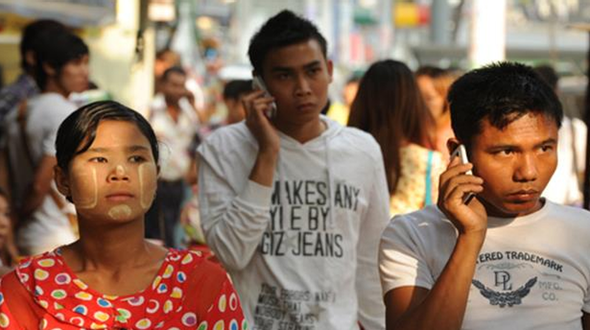 The youth of Myanmar (referred to as Burma, by some) are quite adept with their use of mobile-based social media. Facebook is valued, due to the Burmese language barrier. It’s also used as a news source. Unfortunately, the Burmese take information literally. There is a perception that they use the “share buttons” and “like buttons” indiscriminately, and do not have the full digital literacy to understand what is “real” news or not. International and local groups are trying to educate Burmese about Internet and digital literacy, such as the University of Washington-based Technology and Social Change Group (TASCHA) and its Information Strategies for Societies in Transition project. There’s also Proximity Design, a social enterprise organization, that’s working with local farmers who use smartphones to order supplies and services, to improve their incomes. For development agencies wishing to succeed in Myanmar, they need a face – a personality driving the project and representing the organization, in order to be more effective. For example, Kyaw Thu, a Burmese actor, created the Free Funeral Service Society, which provides funeral services for poor families. He used his presence as a platform to drive engagement. The challenges for development professionals in Papua New Guinea are cultural, regulatory, and infrastructure-based. Its society is quite patriarchal, and noted for instances of sexual violence. Although Internet cafes are popular, mobile phones are the main source to accessing the Internet. However, there are negative connotations with mobile phone use by women and a belief that mobile phones motivate gang activity. Smart phones are decreasing in cost, but the Chinese-made local phones aren’t as reliable. In terms of service providers, Digicel Group Limited (Digicel) has a 98% market share of PNG island access. In 2000, 1% of the population used the Internet in PNG, in 2014 that number rose to 10%. However, Digicel service can cost as much as 1/8th of one’s monthly income. In similar circumstances worldwide, that dynamic has cultivated a culture of regulatory capture. There are additional challenges facing development professionals in PNG. Its topography is composed of highland, lowlands, islands, and not a lot of infrastructure. There is a mining industry with copper, gold, and silver, but 40% of its 250,000 citizens live below the poverty line, and 68% of its urban youth are unemployed. Overall, Papua New Guinea is an interesting market of: challenge, challenge, challenge, and opportunity – that “opportunity” in the form of 90% of its population not yet gaining access to the Internet. One matter of caution: it’s one thing to leapfrog infrastructure via technology, but physical roads are still important. Physical infrastructure can’t be short-changed. Furthermore, only 64% of the population is literate. So there are no quick fixes in PNG, no low hanging fruit. Development actors tend to take infrastructure for granted. From the assessment during the Salon, perhaps a more active role in repairing its infrastructure is required. The major role mobile operators now play in providing Internet connectivity has significantly changed the way people use their mobile phones. Traditional phone calls are just one use for smart devices that are used primarily to connect to the Internet, a service once provided mostly by ISPs. For many mobile operators this means data is now more important than voice. Managing the allocation and registration of the Internet number resources (IP addresses) needed by mobile operators to connect their customers are five regional Internet registries (RIRs). The RIRs operate in a multi-stakeholder network of groups including civil society, the private sector, governments, the academic and research communities and national and international organizations. An important challenge is to ensure this multi-stakeholder community is effectively engaged with all the Internet’s stakeholders. Governments have an important role to play with many regulating and managing the way the Internet develops in their country. In some nations, National Internet Registries (NIRs) perform Internet number delegations and registrations in line with RIR policies. The challenge is to ensure that the Internet does not fragment because of different policies and regulations. It’s important that all members of the multi-stakeholder Internet community, and the wider development community, understand the key principles guiding the Internet’s continued growth and development. One example of this is the need for greater understanding of the importance of Internet Protocol version 6 (IPv6) that was developed to deal with the long-anticipated problem of IPv4 address exhaustion. IPv6 is intended to replace IPv4 number resources and is essential to the continued growth and development of the Internet. On April 14th, the day before this Technology Salon, U.S. Secretary of State John Kerry presented a Global Connect Initiative to bring 1.5 billion people online by 2020. This initiative was presented before the World Bank, technology CEOs, and international finance ministers. As the saying goes, “the Devil is in the details,” and as the Technology Salon DC participants reaffirmed, some of the greatest challenges to Internet connectivity have very little to do with the actual tech.